Good guys won. Bad guys lost. What else is there to know? A lot! So much so that a simplified overview can be very helpful to those just beginning to develop a passion for World War II. World War II was the most destructive event of the twentieth century. It was total war covering the entire globe, and the nations that fought it employed every available resource, harnessing both technology and people to one purpose. If you look at the world today, you'll be hard-pressed to find a country that was not affected by this war. If you want to find out more about this war, without being overwhelmed, World War II for Dummies can help. Whether you're looking for a way to enhance your appreciation of the events that took place or just want to refresh your memory without digging through countless volumes of World War II history, this book is right for you. 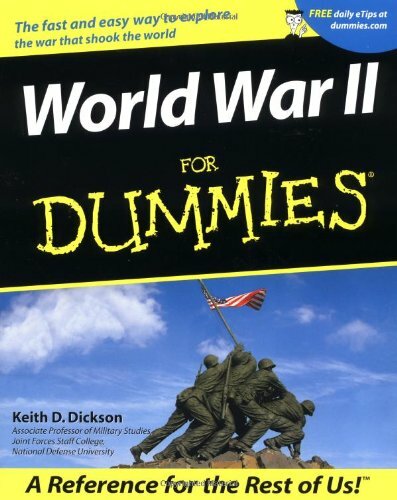 World War II for Dummies is packed with fascinating anecdotes, interesting sidebars, and top ten lists, that clue you in on many of the issues of this war. This friendly reference gives you the scoop on everything from Pearl Harbor and the Holocaust to D-Day, Midway, and more.